This is a phrase I’m sure a lot of us running ultra marathons can associate with, and is how Andy Hewat, known as ‘Whippet’ to his friends views Hardrock, one of the most challenging 100 mile races around. Many people will know Andy for different reasons, mostly as a runner and his ‘unbeaten record’ at GNW, but also as race director for two of Australia’s most stunning races with stark contrasts. The tough and brutal Bogong to Hotham, along with the pretty and picturesque Great Ocean Walk 100 km. However most people know Andy as what we British would describe as a ‘thoroughly good bloke’. The first time I ever knew of Andy was in my first attempt at GNW. We were climbing out of the Congewai valley up towards the communications tower, known to be the toughest climb at GNW. Andy was coming down the opposite way, assisting a runner who was shot to pieces. Andy then had to climb back up the hill to continue his race – that sums up everything you need to know about the man. Ahead of the Great Ocean Walk 100, we grabbed some time from Andy to understand a little more about him as a runner, how he got into race directing and what his future plans are. 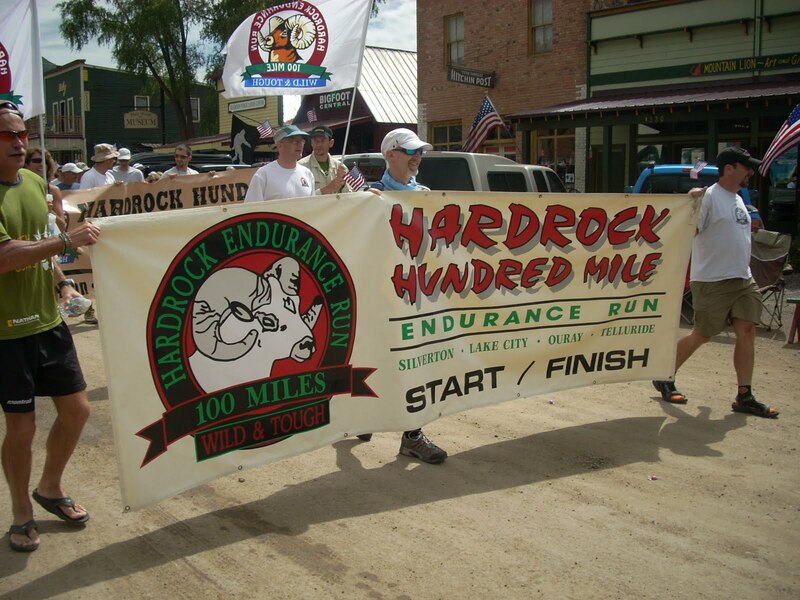 Tell us a bit about your background in running and how you came to be running 100 milers? When I finished playing junior footy I decided I was too small to survive senior ranks so started doing a few fun runs and the occasional triathlon instead. I joined the local Geelong Cross Country Club, which is a really strong running club using a handicap system. This developed my running and competitive edge greatly, bringing down my times and eventually culminating in me winning the ‘Backmarkers Series’ one year, which I am still really proud of. This encouraged me to step up in distance and steered me towards the marathon. I ran 4 marathons in a year but was frustrated at not converting my short speed into a decent marathon time (PB’d at 2:51 twice). While trying to push this I developed chronic ITB problems and ended up spending 2 years struggling with this. As a consequence I started running on soft trail for rehab. I ran a 2km loop repeatedly until one day my loops added up to 50km. 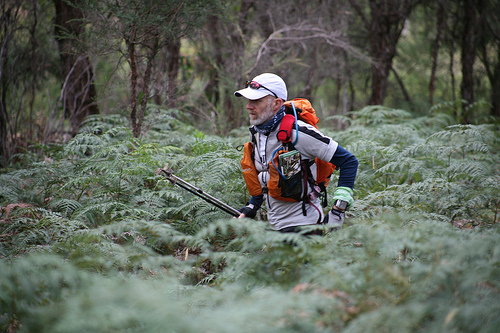 I had heard of the Cradle Mountain race (I used to do a lot of bushwalking) so wanted to enter that. To get a qualifier I entered Bogong to Hotham (ironically my first ultra). I missed the cut (then 5:30) because of a bad ITB flare-up by 20 minutes. Back to rehab but I was now hooked on trail ultras so joined AURA and discovered the Glasshouse Mountains. 100miles seemed like the natural target. It’s a bit like 10km runners, they see the marathon as the standard measuring stick. Any trail ultrarunner looks at 100miles as being the gold standard. I ran the 50 miler at GH in May 2004 and came back to try the 100 in September, but DNF’d at 130km with a debilitating injury. Since then I’ve been back to finish 5 times. You’ve now turned your hand at race directing in the last few years, what are some of the different challenges between this and running a 100 miler? Race Directing is hard work. You don’t realise until you get involved just how much goes on behind the scenes, and if you don’t have a committee or team working with you it is so much harder again. Fortunately I have had great support around race weekends or I would never have had the successful races I have put on so far. Besides the much longer hours in the planning and set-up compared to just turning up to run, you have the responsibility for the welfare, safety and hopefully great experiences for every runner and volunteer to consider. Those who have run my races will attest that I can be a bit of a ‘nazi’ RD, but I am uncompromising around safety and race etiquette. I am a bit old school and believe you need clear and fair rules and they have to be followed by everyone. As much as I hate bureaucracy once you take responsibility for people’s safety you have to really follow all the necessary processes and keep tabs on what is considered ‘best practice’. Running a 100miler is hard work. You need to spend many hours training, but come race weekend you can turn up and just run. It is a very selfish sport, to achieve what we do we have to focus heavily on ourselves. Race Directing is almost the opposite. We still put in many hours of preparation, but when we turn up we are focused on everybody else and our race is not over until everyone is home safely. You’re now the RD of Bogong to Hotham (B2H), how did you come to take over what is one of the most prestigious races in Australia? Ahhh, Bogong to Hotham! Could there be a more pure trail challenge? As I mentioned, it was my first attempt at running an ultra and I have been fascinated and in love with the race ever since. B2H has seen several changes in recent years. The traditional tight cut-off at Langford Gap of 5:30 excluded many potential runners from entering. The race was suffering from low numbers which was fine in the early years, but in order to survive John Lindsay came on-board to help Mike Grayling, the RD, build numbers. They added an early start option, more generous cut-offs and introduced a marathon distance option. This worked well and numbers grew to a record of close to 150 on the 25th anniversary year of 2010 with the addition of a 19km out-and-back beginners option. Unfortunately, John had stepped down by then and his successor had pretty much taken over from Mike. The 2010 race saw a lot of inexperienced runners get into difficulty on what is an unforgiving course, in harsh weather conditions. There were some issues subsequently which saw the interim RD disappear and left AURA, who sanctions the race, fearful of its demise. The AURA committee asked me if I would consider taking it on at fairly short notice. I didn’t hesitate to accept. There were a lot of bridges to be rebuilt but the 2011 race was a success. I have moved to return the race more to its traditional format and 2012 sold out 100 places in just two days despite much stricter entry requirements and a tougher cut-off applied. I plan to return the reputation of this classic race to that which it once enjoyed. Some will claim it is elitist. I simply think this is a race aimed at advanced and experienced runners and I make no excuses for that. My only misgiving is I no longer get to run it. I do get to spend several days on the course though, lugging in water drops. It is truly one of the greatest places on earth. You’ve been a bit of a stalwart on the Aussie ultra scene, how do you think it’s changed in the last five-ten years of so? The last 5-10 years of ultras in Australia have seen a dramatic increase in popularity. When I started 12 years ago you were expected to serve your apprenticeship before stepping up. I remember the first year of GNW100s, I had already run GH100miler and considered it to be ridiculous to even contemplate 2 x 100milers in one year. So I only did the 100km. These days people run a half marathon and then turn up for a 100miler. And scarily some of them do really well. With the increasing popularity we are seeing some really talented young runners coming through, some of them are running at GOW and B2H. There is also a lot more depth and quality in the women’s fields. We have seen Caroline Pivetta and Deb Nicholl win the 100km at GH, Peggy MacQueen challenge for a win in the miler at GH and Beth Cardelli finish outright second at the grueling GNW. We are also seeing a lot more emphasis on safety as organisers are facing tougher requirements and more inexperienced runners turn up. Mandatory gear is becoming standard fare. But there is no doubt that there is still a lot more growth to come as runners discover trail races and realise there are greater challenges than the marathon. You’re a three-time Hardrock veteran – what is it about that race that gives it the reputation of being one of the hardest 100 milers in the World? I missed this year due to illness and it was tough watching from afar. Hardrock is more than just a race, it is an event in the true sense of the word. Runners, crew and organisers all come together for 2 weeks while everyone prepares for the race. Then the race itself is massive. There is no scale that does justice to the enormity of the environment runners pass through. While other races might have similar elevation gain and loss, Hardrock adds the altitude as a potent ingredient. There is nowhere to hide from that. It is brutally tough with tortuous climbs and quad shredding descents but spectacularly beautiful at the same time. There are a thousand places you could so easily die out there. Add to that monsoonal storms that frequently punctuate the race and you have to respect it. A guy got knocked down by lightning a couple of year ago and the course marker was fried into a ball of molten aluminium. Once you run it, it gets in your blood and you want more. It is the one race that both scares and excites me at the same time. What are some of the differences between the scene in the US and Australia? The US has numbers on its side, huge numbers of participants and races. With all that racing and such a big pool to draw upon they produce some great runners. They don’t seem to be burdened with the same layers of bureaucracy that challenge us here in setting up races either. Mind you as I have said, I am not opposed to bureaucracy if it means safer races, but we could do with more of a one-stop-shop approach here. Some form of over-arching regulator that sets the standards as dictated by all the stakeholders and once these are complied with the other regulators are notified. In the States they are spoilt for choices, and with that they have great access to gear markets, clubs and support. I can see us following a lot of their lead but if the recent dominance by European runners is anything to go on we might see a shift in focus to that continent instead. You’re also the only person to have competed and finished a race in each year of the GNW100s, what’s your secret to finishing this monster of a race? GNW100s is a bit of an obsession. I really respect Dave Byrnes’ vision and fortitude to get this up and running. He has been a bit of a role model and inspiration for me as an RD. After entering the 100km the first year, I had to come back and do the 100miler. And so it began, fueled by the fact that after the first few years Dave would single out the handful of us that had started every year. 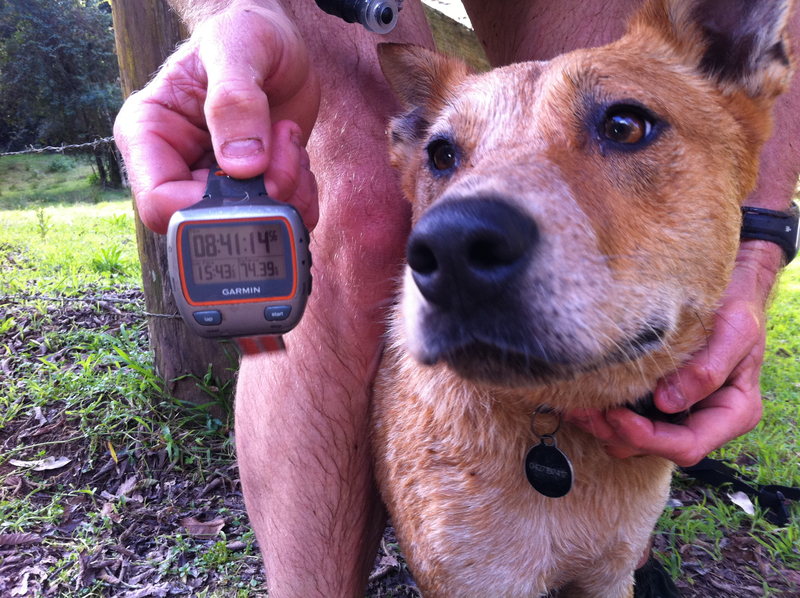 It always came down to Blue Dog and myself, but I always had the caveat that I had only done the 100km the first year. Last year when I came upon Dave at a water drop and Dog was in the back of the Toyota, I suddenly realised I was now the only person who could maintain that record of finishing every year. 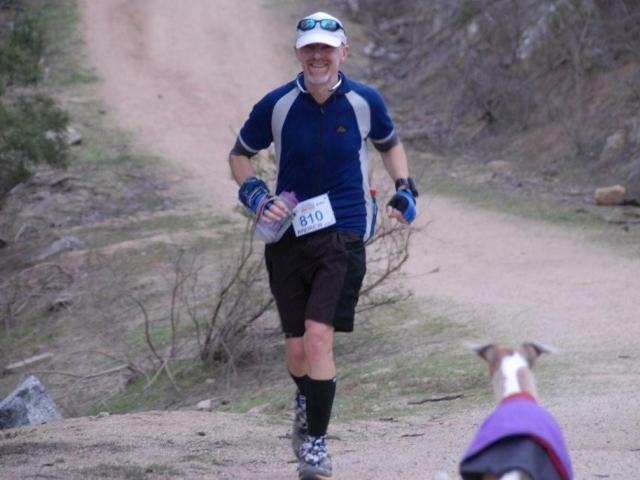 Mind you Dog was in Dave’s ear when I stopped before the finish to help Jane who was in trouble. He was telling Dave “if he misses the cut he’s a DNF, no special consideration”. Of course I missed the cut, and I wouldn’t have minded, Jane’s safety was far more important to me than the record. But I only missed it by 4 minutes and I had spent over half an hour with Jane so Dave credited my finish. I think Dog has been sticking pins in his Whippet doll ever since. It will need to be a damn big needle if he thinks I won’t be touching that pole on Patonga beach again this November. In term so of how to actually finish it – simple, go out easy and don’t upset Dog! How was the idea of doing a race on the Great Ocean Walk born and what did you need to do make it happen? The Great Ocean Walk ultra wasn’t my idea. The RD I referenced in the Bogong discussion was really the guy who started the ball rolling. He got Brett Saxon and myself on board and it was a collaborative effort the first year. That was a huge success. The following year there were some outside issues and similar to B2H I stepped in and said I would do it. Brett accepted to help me out again and it was on. Even after the first year it was a huge effort to get it back together and to a large degree I was starting over again. There were 8 different bodies that all needed to be satisfied before it could go ahead. Getting volunteers to cover the whole weekend was possibly the biggest challenge but in the end I was blessed with a great team who really made the runners experience something special. I hope to build on that and create the kind of race that runners leave feeling they have been a part of a race that they will always remember. It is a magical course. The 100 miler was a feature of the race previously, do you think it will return in the future? The 100miler was a tough thing to cut from the race. Being a 100 mile runner myself I loved being a race director of such a massive run, and it fitted in so nicely with the whole Aussie grand slam concept. But I had real trouble getting the OK for the race this year. A change in government has meant a change in approach to events approval and a lot more scrutiny was applied. While there were no issues with the previous events there was concern about the increasing pressure on the trail so in an attempt to secure the event I agreed to the concession of removing the miler and reducing numbers back to last years cap. That was enough to get me across the line. But only just. I was seriously concerned there might not be a race. Will there be a miler again? To tell you the truth given the trouble I had this year my biggest concern is just securing the future of the race. It is very hard to plan ahead, promote the race and buy all the infrastructure needed without any guarantee that I will get the permits again next year. Good feedback from runners to the local authorities will definitely help but I am also working with the local business community who rely on events like ours to bring people in. What are some of your future goals from both a running perspective and from an RD’s point of view? Those that know me personally will know I have been going through a pretty bad patch with health problems. It is no secret (I have been chronicling the progress on my blog and in the 2nd edition of Trail Run Magazine AUS/NZ) that I have a heart problem that has severely impacted on my life in general but more specifically my running. I have recently had some surgery which I hope will help but won’t know for several months yet. I can still run but in a reduced capacity. After pulling my entry out of Hardrock, my personal running focus has been all about getting to GNW. I know if I get on the start line I can finish it. I have been there unprepared before and although it was ugly, the scores are on the board. Ultrarunning is more mental than physical. I have relied on that mental strength to get me through this illness so far, and although I may never completely recover, I am confident I have enough to get me back out running ultras. It is what I love to do and I won’t give that up lightly. From an RDs perspective my focus right now is all about getting GOW and B2H up and running. I have a couple of other races with the plans all drawn up but my illness has forced me to put those on hold and use what energy I have to ensure the success of GOW and B2H. I have also been doing some online coaching and writing some stuff for the new online Trail Run Magazine AUS/NZ as I really love sharing my passion for all this stuff. It would be nice to think you could make a living out of doing all these running related activities but I would be afraid to add up all the man-hours put into organising a race and writing stories or programs. I guess we do it because we love it and want to put something back into it. What’s not to love? We’d like to thank Andy for his time and for sharing his thoughts with us. We can’t wait to shake Andy’s hand on the beach at Patonga for what will be his seventh finish at GNW and will mark a very special occasion I’m sure. Nice interview with a great mate, love your work Andy. I second that! 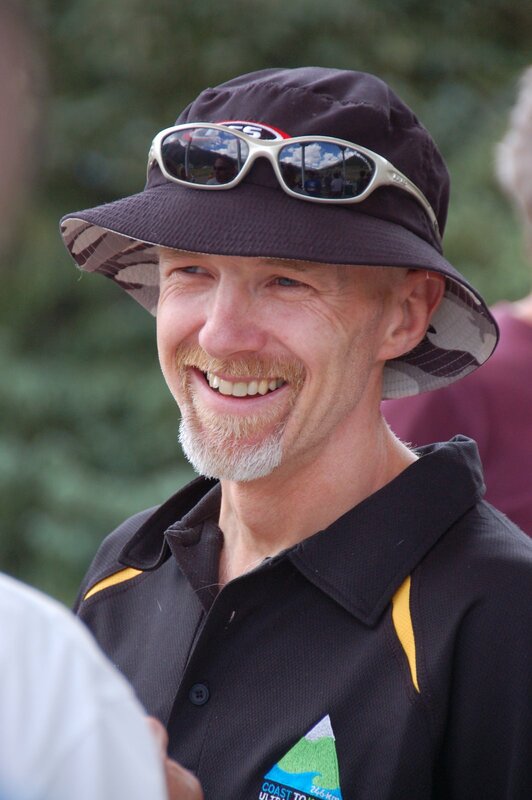 The Aussie ultra scene is so lucky to have Whippet, both as a race director and a source of advice and kind support, particularly with the big influx of newbies. When he visited us in Berkeley, he enjoyed seeing huge teams of goats eating the brush along the trails, going to yoga with me, stopping to eat ripe yellow plums during a run — he was a delight to be around. What a top bloke, a role model and inspiration. Thanks Ultra168. Whippet, perhaps Darrel was right all those years ago! Fantastic responses and It’s great for everyone to get to know you better. See you in Teralba, AV. The start list of B2H and GOW says it all. It wasn’t long ago that to get the results for B2H people had to email each other and say “Oh yeah I think I was 7 minutes behind you at the finish, so put me down for a 8:54”. Now we have sell out races, deep fields ready to race hard and all taking place in the most stunning environments on the earth. Bravo Whippet, Brett Saxon and the teams of helpers behind the scenes. I will never forget Andy’s assistance in helping me get to the finish of my first GNW miler. He can never do enough to help other runners. Straight up top guy. See you at Teralba and Patonga. Obviously a guy who loves the sport, loves participating and also gives so much back to the sport. We could all learn alot from him. Good on you Andy! Because of guys like whippet Ultra Running has gone from strength to strength.Haven’t got over him cutting the GOW 100 miler but he is allowed one small blemish. Whippet’s Hardrock race reports from years ago allow me to dream and also give me nightmarish chills when I look at the entry form sitting on my desk. It makes a real difference when you read an interview with a person you have met personally and have had some online contact with over the years. I sat in a car coming back with Andrew from the Six Foot Track in 2007 – I was trashed and he showed genuine concern for me as my body was cramping up. To echo what Carol has already said, Whippet is one of the nicest guys in the ultra scene in Oz or in the USA. A joy to be around, his modesty belies his running, and RD, achievements. That top position on the GNW Honour Board is only temporarily on loan Whippet. Nice interview; you actually have one ort two likeable qualities. See you at GNW. ‘Break a leg’. Blue Dog, in terms of km’s raced on the GNW Whippet is only 35.4km ahead of you. Did you ever meet Andy Jones Wilkins at Western States? He’s the American version of you. AV, no I’ve never met Andy Jones Wilkins, but hey, most people want to be a version of me. What’s not to like? Truth is there is only, and only ever will be, one Blue Dog. The body is healing and y’all haven’t seen the best of The Dog yet.